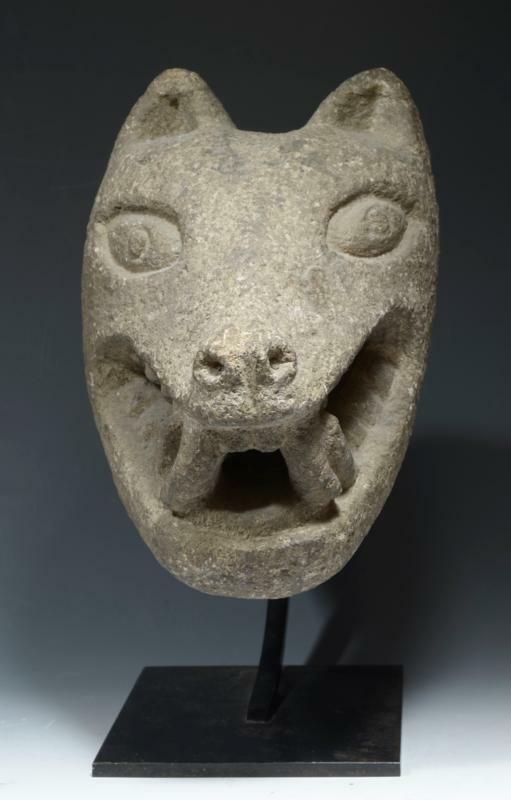 Fine carved voluminous head of the canine God Ahuitzotl, a formidable force in Aztec mythology, legendary for his spiked fur and penchant for devouring human flesh. This portrait head has a long neck, possibly a tenon joint for fitting into body which has since been lost to antiquty. Open mouth with sharp triangular incisors bared and ready for attack, with almond shaped-eyes and flared nostrils. Triangular ears atop head. 10-1/2 inches L x 8 in W. Cf. Shook and Marquis, Secrets in Stone for the facial type. Ex NY Collection. Nice ancient surface deposits attest to the authenticity.